On the first of several “dead weeks” after the track season, running fans were treated to a match-up of three different eras of distance running dominance. Mo Farah, Kenenisa Bekele and Haile Gebrselassie all made it to the start line of the Great North Run on Sunday. Nobody would have blamed them if the race turned into a Hall of Fame procession–13.1 miles of a controlled effort with a half-hearted sprint finish for the crowd. Farah, after all, just finished a long season on the track, Gebreselassie is on the wrong side of 40 and Bekele, well does anyone know what happened to Bekele after he went from gold medal threat to not even on the Ethiopian team in one year? Instead, we got an actual race where all three ran up to their potential and produced a YouTube friendly finish. 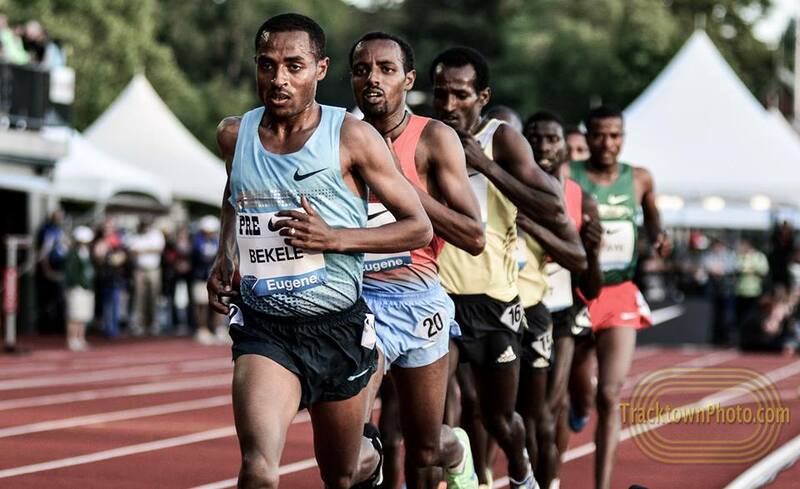 Farah showed yet again his potential at the longer distances, Bekele revitalized his career and Gebrselassie continued to age gracefully….and swiftly. But we just watched them race? We did, and Bekele was cagey and tough in a way we haven’t seen since late 2011 when he ran 26:43 in the 10,000. But hold this race a few months earlier in the year, or a few months later and Farah would have the edge. At this point in the year it is important to consider the training and motivation of each of the athletes. 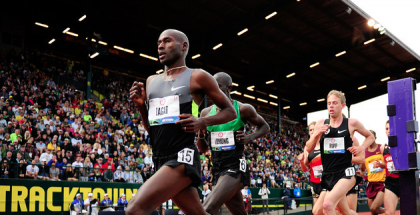 After peaking in Moscow with double gold, Farah was primed for a post-championship letdown. He hasn’t had time to fully recuperate from the World Championships, let only prepare for a distance he is still unfamiliar with. That isn’t to say Farah has spent the last few weeks doing nothing , but it had to be difficult to get up for this competition at the end of such a taxing season. Contrast that with Bekele, who was left off the World Championship team by his national federation. If you believe being slighted motivates athletes, then Bekele had every reason to train like mad to race against Farah and Gebrselassie. Physically and mentally, Bekele looked to be the freshest runner on Sunday. -Bekele is guaranteed to succeed at the marathon. After the race, Bekele said his future plans include a full marathon. Running close to 60 minutes even and beating the best distance runner on the track is a great debut. However, there have been track greats before who have not been able to replicate their success at shorter distances to the marathon. The most common example is Eritrian Zersenay Tadese who holds the world record in the half-marathon, but has yet to crack 2:10 in the full distance. Given Bekele’s age, 31, his recent history with injuries, and the amount of miles already on his legs, his window for a time that would put him in contention for a major marathon win is relatively small. Farah’s presence alone made the race a must watch. Now, it looks as if Bekele also wants to make London the site for his first attempt at the marathon. A double debut! Similar questions that I raised above about Bekele’s adaption to the full distance apply to Farah. By no means is he a shoe-in to dominate at 26.2 miles. What is guaranteed is Farah’s first foray into the distance will be one of the most anticipated debuts in marathon history. Add in the home crowd, and potentially Bekele, and…I’m overhyping a race that isn’t happening for another seven months, aren’t I? He set the pace and was rewarded with a third place finish and the over 40-world record. Or, it could have been an over 45-years-old record if you believe some of the reporting about his age. Regardless, it is preposterous that he is running this fast at this late stage of his career. On Sunday, you knew eventually he wouldn’t be able to hang with Farah and Bekele but he stubbornly hung around and finished just over 30 seconds back. The multi-million dollar project to get the perfect shoe for Farah’s “loping” stride is underway. -In the women’s race, Priscah Jeptoo upstaged the Meseret Defar/Tirunesh Dibaba battle and ran the third fastest time ever in the half-marathon, 1:05:45. Defar finished second and Dibaba was third. Jeptoo is not on the start lists for either Berlin or Chicago so it is safe to assume she will run in New York City in November. -Also in New York City will be Stanley Biwott, who won the Philadelphia Half Marathon in 59:36. If you are wondering what a 59:36 and a victory in a big city half marathon gets you the answer is $3,000. Or 1/$266,666.00 of what Heisenberg made. There are still track meets? There are, the biggest of which was the Great City Games, the street track meet held the day before the Great North Run. Sally Pearson won the 100-meter hurdles and then came back to defeat Natasha Hastings and Christine Ohuruogu in the flat 150-meters. An odd distance double against two 400-meter runners, I’m not sure how to score this is. Pearson is healthy, which is good sign for her and anyone hoping to see good non-championship year match-ups against Brianna Rollins next season. Full results from the Great City Games including Mike Rodgers in the 100, David Oliver in the 110 hurdles and Morgan Uceny in the mile, can be found here. 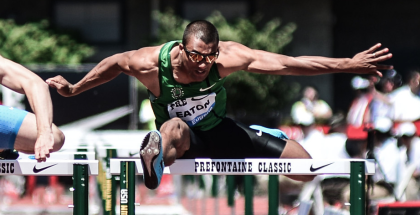 –Ashton Eaton did not finish the Decastar competition in Talence, France. Eaton withdrew after he sprained his back during the long jump on the first day of the competition. By failing to finish, Eaton also lost a chance at the $30,000 that comes with winning the IAAF Combined Events challenge. In his absence, Canadian Damian Warner scored 8,161 points to win the competition. Pole vaulter Renaud Lavillenie completed all ten events, but did not set the world record for highest pole vault in a decathlon. Hey, we’re in a records drought we’ll take anything this year. Moscow gold medalist Hanna Melnychenko won the heptathlon. Minus Makau, what are the prospects for a world record in Berlin? Believe it or not they may have actually increased. There is ample evidence that too many fast people in one race actually causes the race to slow down–known as the “looking around at each other” syndrome. With a deep field, the chance for a competitive race is higher, runners start trying to win instead of trying to run fast. We have no idea if Wilson Kipsang is in world record shape or if the other elites in the field will challenge him, but not having to worry about Makau may actually free him up to take the type of risk that is necessary for a world record. -Last week he claimed he could beat Usain Bolt. This week he questioned Carl Lewis’s manhood. Where will the “Ben Johnson Pisses off the World” Tour take us next? **Will he train a dictator’s son? Nope already done that. **Or, what if he started a clothing line with the tag line, “Catch Me”? Really. That too?